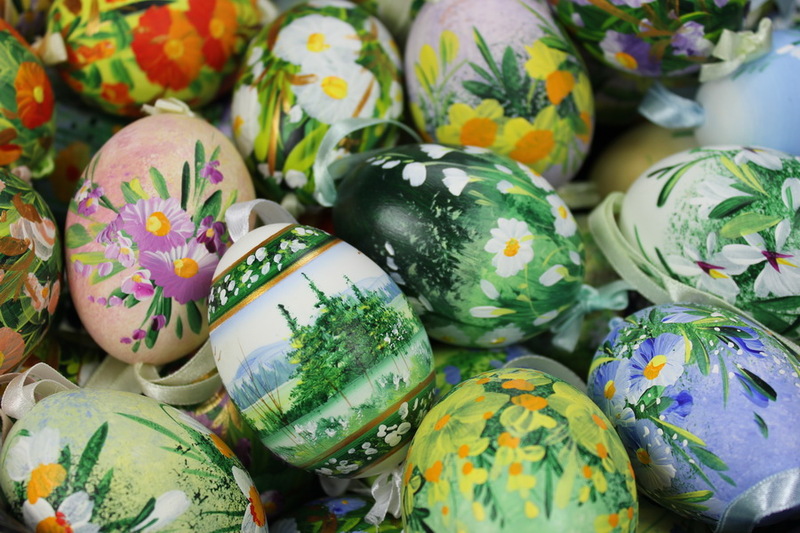 Poland has long traditions of Easter eggs hand painted. The quickest method of coloring eggs is dipping them into hot water with dissolved dye. One can also cover the egg shell with a pattern created by using the melted wax, and then immerse in a solution of dye. The most interesting and valuable Easter eggs are created by artists who hand paint the eggs, either eggs shells or wooden or made of glass. Typically shells are used of duck eggs or goose eggs. See here some great examples of artist hand painted Easter eggs. 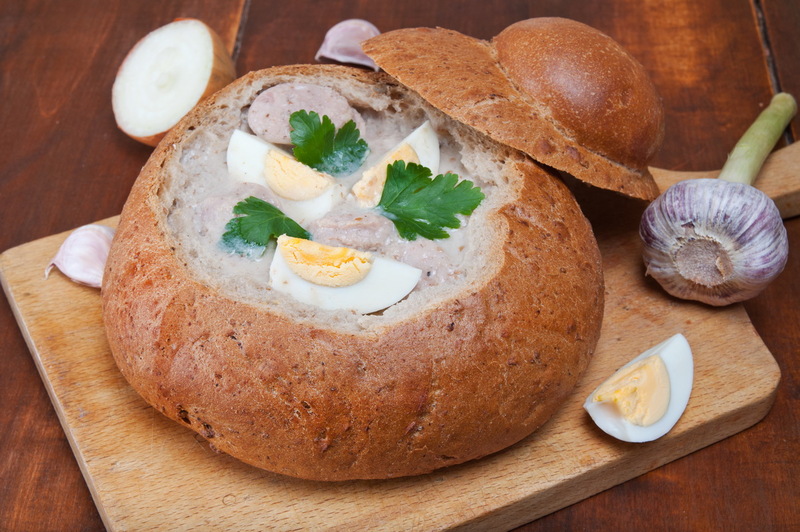 White borscht soup, in Polish bialy barszcz or żurek wielkanocny, is typically eaten on Easter Sunday in Poland. The soup is soured by fermented bread and thickened with a roux (butter cooked with flour). Potatoes, along with sausage and hard cooked eggs are often served in the soup. Many restaurants serve it nowadays for additional effect in a bowl made of bread. 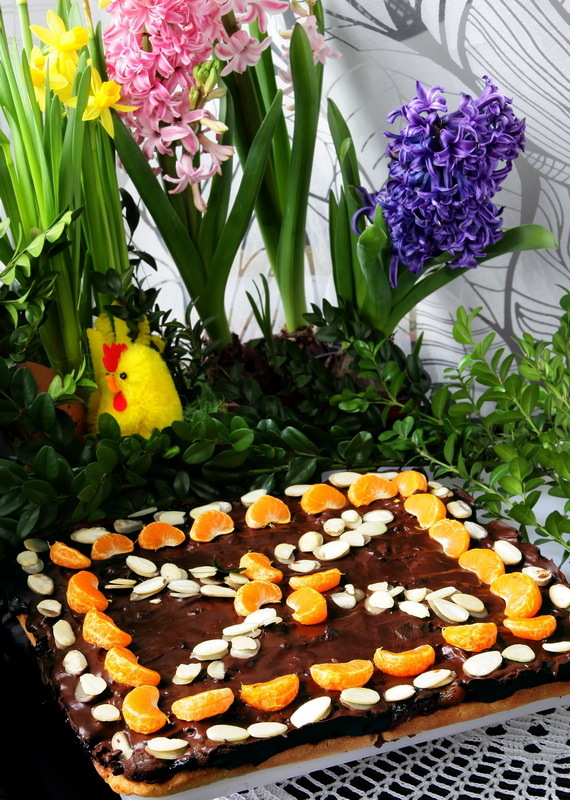 Mazurek is a traditional flat Polish cake baked for Easter. It can be called a shortcrust tart. Typical is Mazurek’s low height , only 1 to 2 cm (less than 1 inch). It is covered with icing – a very sweet paste, either Dulce de leche (slowly heated sweetened milk) or sweet orange paste, and decorated with dried or fresh fruit, almonds, nuts, raisins. 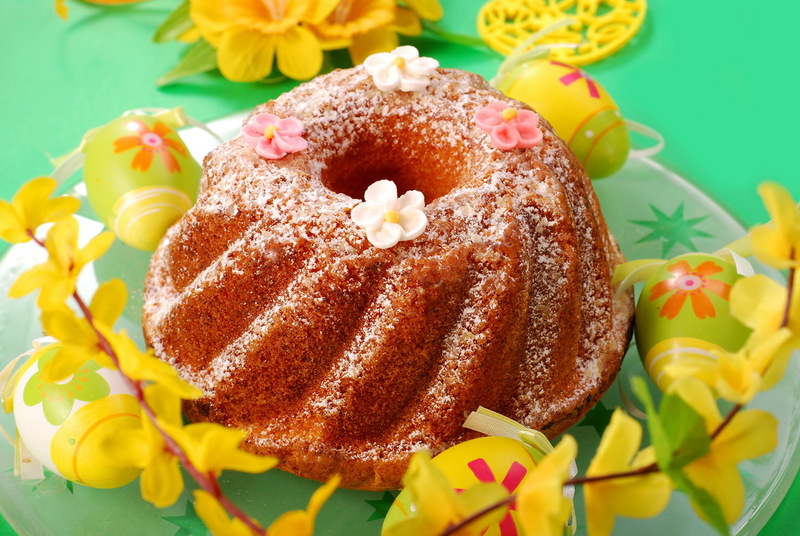 Polish Easter cake called “baba” or “babka wielkanocna” is a simple yeast cake made up during Easter. Deep fried Polish doughnuts, covered with powdered sugar. Called in Polish “pączki” with letter “a” having a little extra line so it looks like “ą”. If a plan letter “a” is used, this word has a completely different meaning and means “packages”. 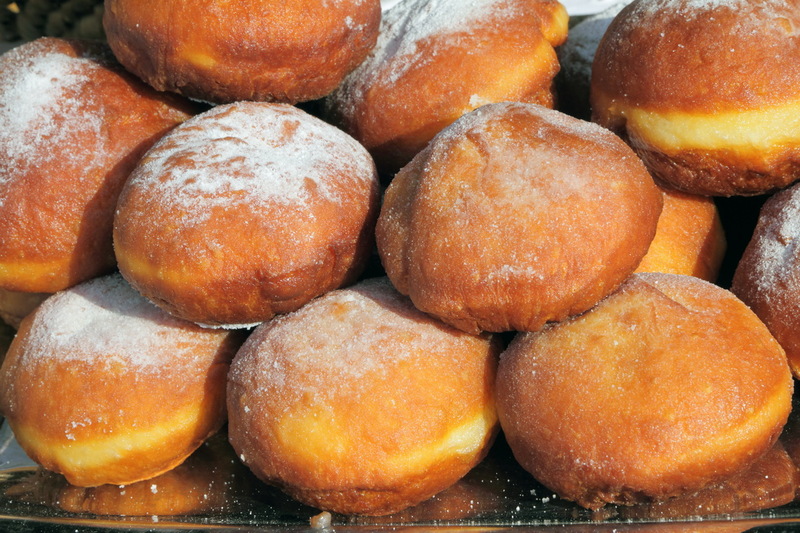 Everybody in Poland eats these doughnuts on the Fat Thursday holiday, if you don’t , it brings bad luck. 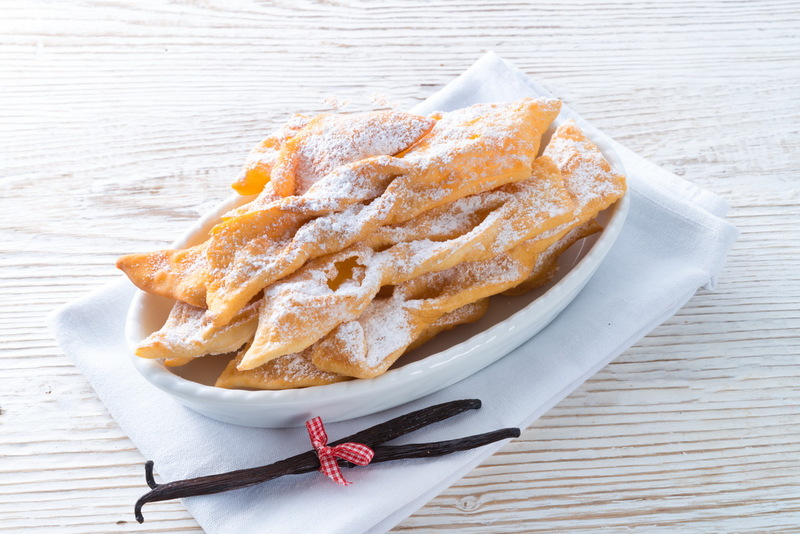 Fat Thursday, in Polish “Tłusty czwartek” is a traditional Catholic Christian feast marking the last Thursday before Lent and is associated with the celebration of Carnival.